Missed cues, dodgy sets, absent sound effects and misplaced props are ordinarily a Directors nightmare. 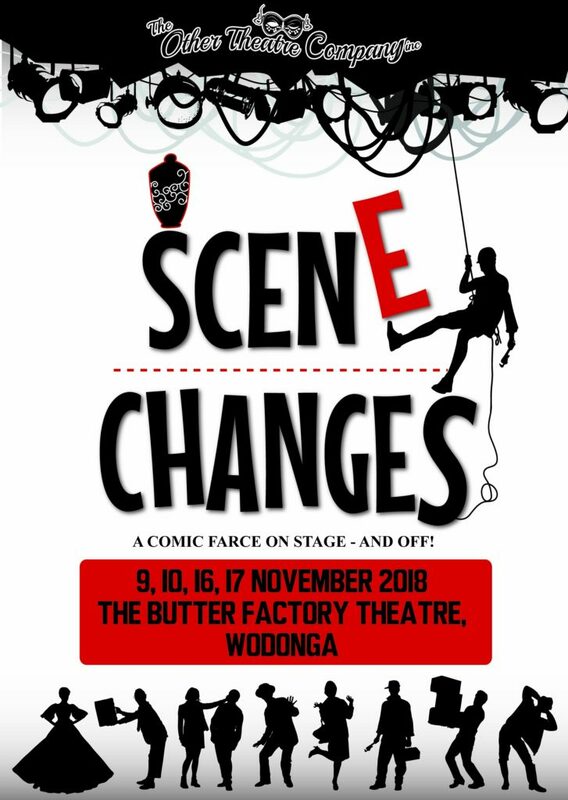 SCENE CHANGES has been written by Border local, Peter Uniacke. My note is a list of hearty THANK YOUs to all the people that help make a show like this possible. Thanks to Peter Uniacke for capturing the disorder that sometimes occurs behind the scenes. He has done this almost too well…Multi talented, he created the fictional Crampston Regional Amateur Performers and their various eccentric characters and painted Vincent Van Gogh’s Sunflowers to decorate the set. A painting of a vase. It all makes sense. He is already working on the next play. Keep them coming Peter. Thanks to the wonderfully patient cast who at times during rehearsals must have wondered how all the confusion and bedlam would all come together. And a big big thanks to Jamie-lee Mccall who has been invaluable in designing and building the set, sourcing set decorations and set pieces. Her enthusiasm and creativity is amazing. Thank you. Thanks to you the audience, for supporting local theatre. If you’d like to get involved, please get in contact with us. It only takes a phone call…that’s how it all started for me. It was in 2014, as a way of celebrating our wonderful local Amateur theatre scene here on the Border, that the idea of having a play which paid homage to the back-stage crew was born. I wanted to give the audience the experience of what it was like to be “out the back” on opening night. At the time The Other Theatre Company was holding a series of Writers workshops for the stage. I asked for anecdotes. Those moments when things go wrong. On stage. In front of a live audience. The discussion that followed not only yielded over 35 examples; but also had our little group both gasping in amazement and producing gales of laughter. I promised to go away and write a full-length play that incorporated the whole list. And so, Scene Changes was born. A special thank you to Director Miguel de Oliveira, for boldly taking on an old fashioned “farce” in two Acts and getting it “up on the boards.” Thanks to the cast and crew for bringing the authors words so vividly to life. Scene Changes is unique in that almost all of the real back-stage crew get to play a character on stage at some time during the play, giving them the acknowledgement they so richly deserve.